I consciously find time to visit a bookstore, and recently, after numerous visits, I eventually bought one of my sought-after-but-maybe-next-time books. You know that one book you really wanted to buy but opted to hold it for the time being for you to buy next time around? That’s what I Am Malala is for me, and it did not disappoint. The book narrates the experiences of Malala Yousafzai, a Pashtun (an ethnic group in parts of Afghanistan and Pakistan) activist who, despite her young age, ardently fights for the right to education, especially for girls, in her hometown in Swat Valley, Khyber Pakhtukva Province in Northern Pakistan. But Malala’s struggle almost came to a permanent halt when, on her way home one afternoon in 2012, their school bus was ambushed and she was shot. She miraculously survived after surgery and rehabilitation, and is now known as the girl who stood up for education and was shot by the Taliban. Today, she remains a symbol of courage and hope. Well, maybe you’re thinking that Malala’s story is just another inspiring story, just like what we casually find while browsing our news feeds. But I just want to add that Malala is the youngest Nobel Peace Prize laureate ever at age 17. Yes, you read it right—seventeen. I hope that fact alone would encourage you to grab your copy but if that’s not enough, then read on. I highly encourage parents, soon-to-be parents, or those thinking about having kids in the future to read I Am Malala as it imparts many things about parenting and, more importantly, family. Malala’s father, Ziauddin Yousafzai, used to be a teacher-activist who runs his own school in Swat (now a diplomat and works with the United Nations) while her mother, Tor Pekai, is a housewife who cannot read and write, as women in Pakistan are not allowed or are discouraged to attend school. Both Malala’s parents, as well as her two brothers, have been instrumental in the development of her ideals and visions in life. Living in a conservative society, there have been many prohibitions and rules that should be followed. But her parents did not stop her to reach what she wants to achieve. One of her dreams is to go to school, and her parents gave her the green light without protest. The Yousafzais teach us how to be protective and supportive of your family. The family, as the core unit of the society, has a fundamental role in social development as it is on the forefront in nurturing future generations. Being supportive of what your children want to achieve and how they plan to do it should not be used as grounds for parents to be accused of negligence. Yes, parents should guide their children but they should also trust their children to do what is right. And that’s what Malala did. She did what she thought was right. 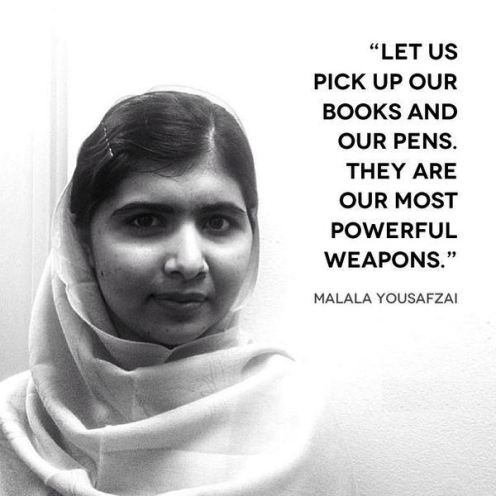 Malala fights for the right to quality education for all, including women. But with the presence of Taliban, a fundamentalist political movement waging war within her country, this remains an elusive dream. As a result of Taliban presence, she also envisions her fellow Pakistanis to be freed from terror, and to help young girls to be empowered and realize their potentials. Are these issues familiar? Inadequate number of books, chairs and tables and flooded classrooms bombard the headlines every June. Hunger and suffering of internally displaced persons down south. Women struggling to break free from the machismo culture. Yes, these issues sound familiar, as they are also happening in our very own Philippines. Pashtuns, Malala’s ethnicity, are considered a minority in Pakistan which means they suffer several forms of marginalization in socio-economic and political terms. This is why they most likely suffer from poverty and oppression compared to those from other provinces and cities such as Islamabad, capital of Pakistan. This marginalization is a product of long history of cultural divide, colonization and politics. Again, those things sound so familiar, don’t they? Philippine history tells us that our then colonial masters managed our fate as a nation and “inadvertently” included the Sultanate in the south. Fast forward to the present, we now have subjugation of certain ethnic groups which we often tag as “minorities” who suffer from different forms of marginalization. This is also why some of us are hesitant to book that flight to Sulu, or perhaps, Tawi-Tawi. Again, thanks to the long history of cultural divide, colonization and politics. With that, I conclude that Pakistan and the Philippines are truly not light years apart! In fact, we’re very much alike. I Am Malala shows us how solidarity can invoke change. We have to be hopeful and, at same time, courageous to question the things happening around us. If we’re not part of the problem, then it is our responsibility to become part of the solution. But if we’re part of the problem, then there is no other way but to change. And if it all falls into the right places, then the world will become more beautiful. We might be very far from our ideal world where equality, prosperity and peace prevail. But if a 17-year old Malala believes it will eventually happen, why shouldn’t we? Malala is an outstanding student, a bookworm and an excellent speaker. Her parents gave her all the resources they can give despite them being underprivileged. In return, Malala has maximized the given opportunity to better herself and to inspire other people. Since her father, Ziauddin, is a teacher-activist and has been involved in various advocacy concerning their community, it is not far-fetched Malala would inherit such passion. Being a studious girl, Malala found her medium through blogging. She started her campaign for the right to quality education as a blogger in BBC Urdu. Since then, she has been participating in several interviews, and that’s how she got the attention of the Taliban. 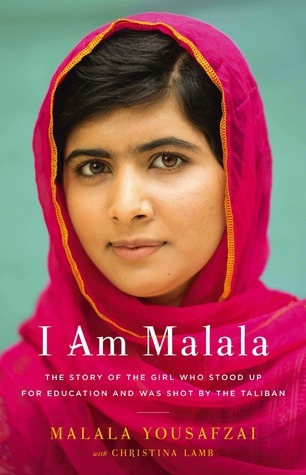 I will not reveal Malala’s reading list here, but I assure you, you’ll never guess what books Malala has already read. And how many! So you better learn about it from her book. After being shot, Malala captured the attention of the world and has become a symbol of courage and hope. She was eventually nominated and won the Nobel Peace Prize in 2014. From a small town in Pakistan, Malala has now gone far but the battle has just begun. For us, we might not be aware of the battles happening around us. Or we might have chosen to not see our very own battles. We become slaves of our everyday lives or get so engrossed with our lives not minding the lives of our neighbors, of the jeepney driver who drove you home, of the security guard who yawned, or of the elevator girl who pressed GF for you. You just wake up, dress up, eat the cold rice from last night, ride the jam-packed semi-dilapidated metro rail to work, get scolded by your boss who pay you meager salary that you can’t even buy a I Am Malala paperback with.